The Timberline at Shelton baseball game has been rescheduled due to weather. 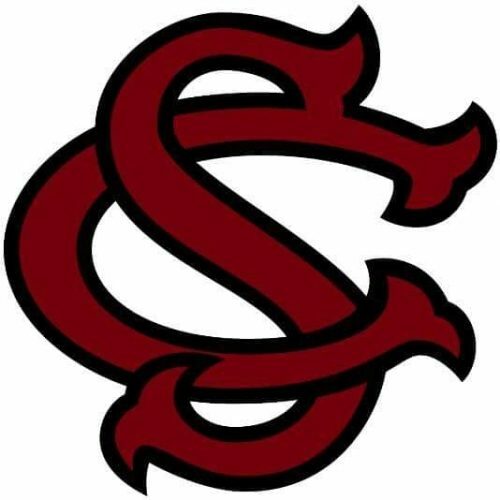 The South Sound Conference game is now set for 4 PM Thursday, April 11, 2019. MasonWebTV Powered by HCC will broadcast the game Thursday. The Our Community Credit Union On-Deck Show starts at 3:50 PM. Weather has also changed the location for the Shelton vs. Capital fastpitch softball game. That South Sound Conference game is now being play at RAC (Regional Athletic Complex) in Lacey. The Shelton baseball team opened their two-game series with Timberline Tuesday with a 5 to 2 win. The Highclimbers scored two runs in the 1st inning with two-out and two runs in the 2nd inning. 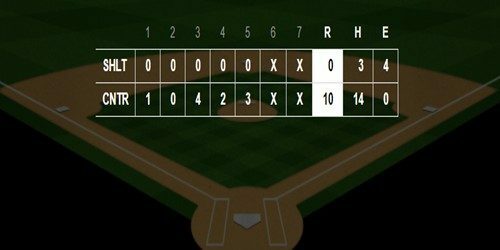 The Shelton baseball team was held to three hits at Central Kitsap Tuesday and lost 10 to 0. Highclimbers with hits were Brenden Engstrom, Brenden Wagner and Trey Dehning. Picture provided by Shawna Whelan Images. Additional high quality prints and images from the game are available by clicking the picture. Use coupon code EB2127042535 to receive a 15% discount. 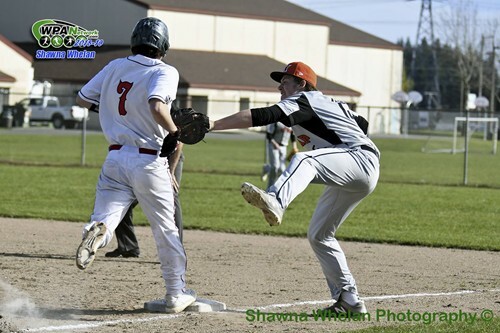 The Shelton baseball team picked up its second South Sound Conference win Monday knocking off Central Kitsap 4 to 1. Brenden Engstrom picked up the win on the mound, allowing one run on two hits while striking out 12 and walking three. He also batted in two runs. The Shelton baseball team shut out Lakes Friday 9 to 0 in non-conference action. The Highclimbers’ Austin Ramsfield, Kevin Snodgrass and Brenden Wagner each batted in two runs. Ramsfield was 2 for 3 at the plate with double and a run scored. Snodgrass was 2 for 2 with a double and a run scored. Wagner went 2 for 3 with a double and scored a run. Blaine Van Aagten was 1 for 3 with an RBI and scored two runs. Adam Goldsby was 1 for 1 and scored a run. Trey Dehning, Josh Deemer and Matthew Osberg each scored runs. Watch the Shelton baseball team host Lakes. First pitch for this non-conference game between the Highclimbers and the Lancers is set for 4 PM. Dedrick Allan will start the Our Community Credit Union On-Deck Show at 3:50 PM. 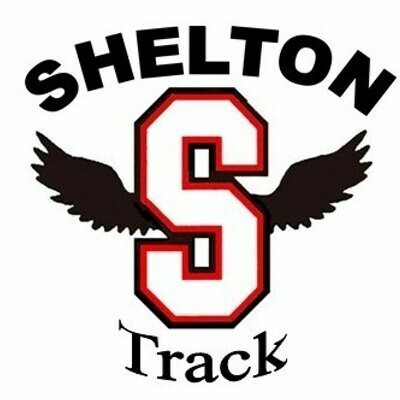 The Shelton track and field teams took on Gig Harbor and Yelm Thursday at HIghclimbers Stadium. The Lady-‘Climbers finished 2nd in the team scoring while the boys were 3rd. Victoria Silverman won the girls’ 100-meter hurdles and the girls’ 300-meter hurdles. Miracle Horne won the girls’ 400 meters. Kyle McGregor won the boys’ discus. Raymundo Mendoza won the boys’ 300-meter hurdles and was 2nd in the boys’ 110-meter hurdles. The relay team of Austyne Cralle, Trinity Payment, Kamdan Nicklaus and Victoria Silverman finished 2nd in the girls’ 4×100. Alauna Carstens finished 2nd the girls’ 1600 meters. McKenzie Salazar-Fox placed 2nd in the girls’ discus. Sirius James took 2nd in the boys’ 800 meters. Tyler Youngquist finished 2nd in the boys’ triple jump. Austyne Cralle was 2nd in the girls’ triple jump and 3rd in the long jump. Brock Knowles was 3rd in the boys’ 1600 meters. The Highclimbers are off next week for Spring Break. They take on Central Kitsap and Timberline on Wednesday, April 10th. The Shelton fastpitch softball team lost to Gig Harbor Thursday 10 to 0 in five innings due to the 10-run mercy rule. The Lady Highclimbers had seven hits but couldn’t advance a runner past second base. Kamryn Highland went 2 for 2 at the plate with a double. Taya Gouley was 2 for 3. Alex Walters, Phoenix Miller and Angela Mellors each went 1 for 2.